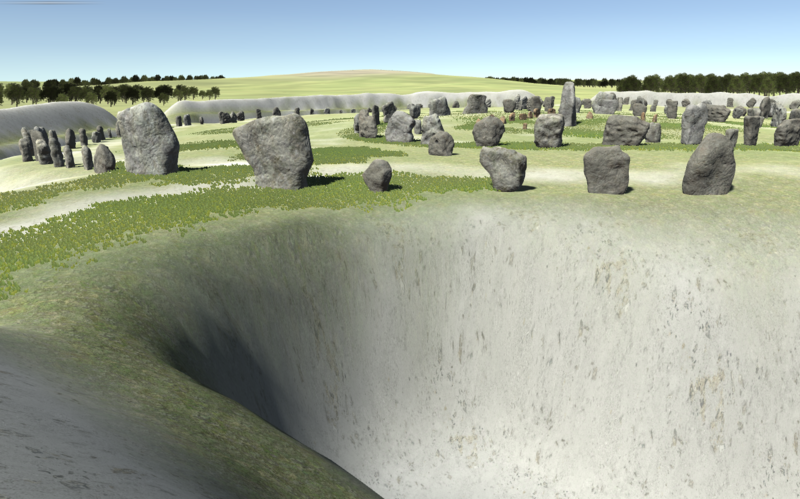 The simulation of Avebury being creating as part of the Virtual Avebury project is being built in Unity 3D by virtual reality specialists Daden Ltd , with bespoke soundscapes developed by a consortium of sound and performance specialists, Satsymph. Both companies are partners on the grant, together with National Trust. Daden is hosting the simulation on their FieldscapesTM platform for the duration of the grant and for 2 years afterwards. The terrain has been modelled from a grey-scale map created from lidar data that is openly available from The Environment Agency; the terrain has then been modified in Unity to deepen the ditches and raise the banks of the henge to their likely dimensions around the time they were first constructed, estimated to have been between 2,800 – 2,500 BCE. The stones and other 3D models, such as deer antler picks and pottery, are created as textured mesh models in 3D modelling software and uploaded as inventory items to Fieldscapes. From the inventory, copies of the assets can be deployed wherever they are needed in the Virtual Avebury simulation. The soundscapes reflect the kinds of sounds that would have been likely to be heard at that time, such as animals, weather, distant voices (with no discernible language) and human activities such as flint knapping. The simulation is now complete and we are undertaking final testing before the public engagement phase of the project begins on the 5th June. Details of how to experience Virtual Avebury and take part in the project are on our project website. Virtual Avebury will be on display as part of the Festival of Learning on Saturday 16 June.